The Bad Taste of the Town is one of William Hogarth's earliest satirical engravings concentrating on the popular theatre culture of the age. In this scene of kinetic energy we see Hogarth has depicted a myriad of people, merging, clashing and conflicting. Set outside Lincoln's Inn Theatre, we see all kinds of contemporary entertainments depicted, such as the conjuring act of Isaac Fawkes, Opera, and the Commedia dell'arte pantomimes that were very popular at the time. On the top of the 'Academy of Arts' we can see the stone figure of the contemporary architect William Kent towering above and overshadowing those of Michelangelo and Raphael, illustrating Kent's inappropriately high status in art according to the tastes of modern art patrons. Criticism of foreign culture and theatre is also expressed in the foreground of the etching, where we see a woman pushing a wheelbarrow peddling the works of Shakespeare, that are being advertised as 'waste paper,' showing the depreciation of what Hogarth regards as 'true' art and culture. Overlapping signs are seen throughout, giving the scene the appearance of a collage. 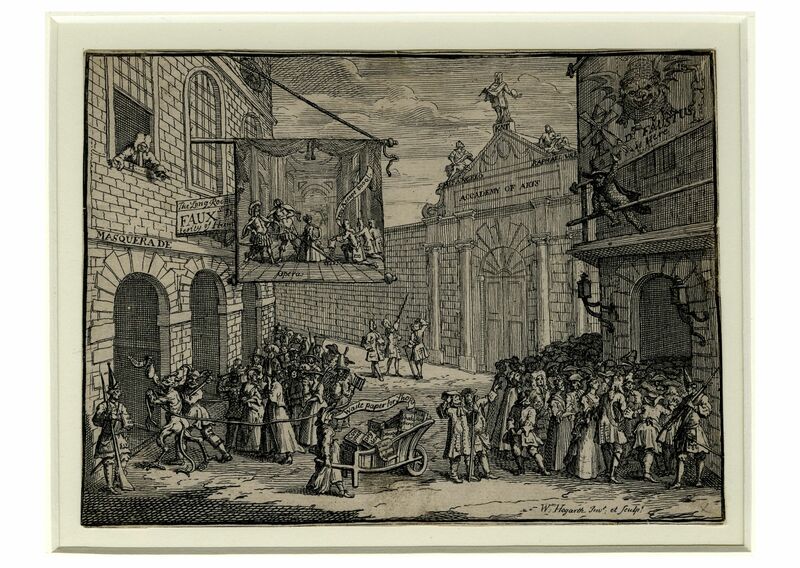 Much of the overlapping signage alludes to masquerading, or false representation, for which Hogarth ridicules the theatrical institutions and their patrons.